Aerial vision recorded as river rises in Rockhampton. News For the third time, John Peacock has been forced to live in the centre, escaping the harsh reality of his inundated Depot Hill home. News DAD and his family are extremely worried about what could happen next. 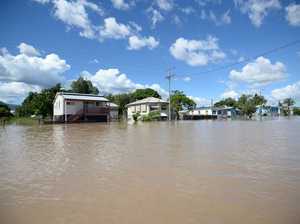 Critical Alert FLOOD experts will not tell Rockhampton the flood has peaked. Critical Alert ROCKHAMPTON homes that could go under if the Fitzroy rises anymore.